So for Christmas my step-sister, Shikha, asked what I would like for Christmas, I always struggle to think off the top of my head what I would actually like so I just said 'get me anything from Lush' which I think is a pretty safe bet no matter who's asking! You could literally buy me anything from Lush and I would love it I think. 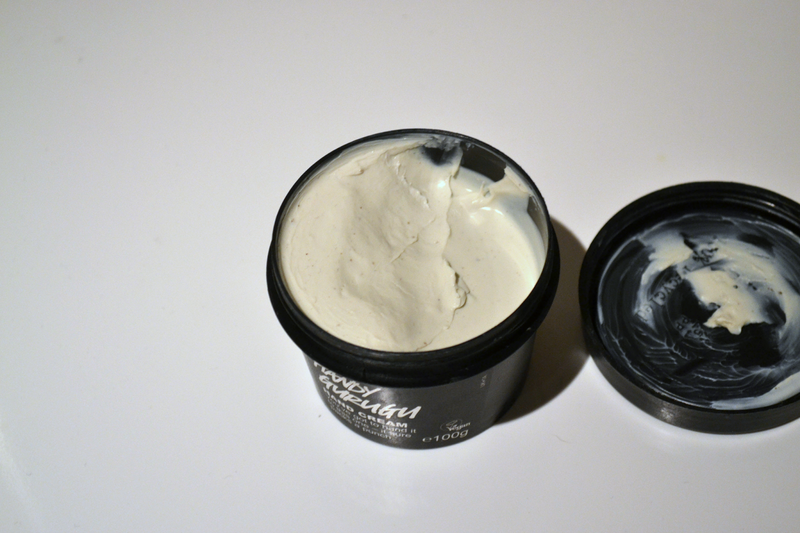 One of the things she bought me was a tub of 'Handy Gurugu' hand cream; Lush is heavily featured on lots of beauty blogs but it's usually bath products or face masks, I don't think I've ever seen a Lush hand cream reviewed on any of the blogs I read - so here we go. Lush customers had been crying out for a more intense hand cream, and this is what they came up with; it's a 'powerful super moisturiser for extra dry hands'. My hands aren't excessively dry but they have suffered a little this winter so I've been using hand cream a lot more than previous years. The product is incredibly thick for a hand cream - it's a good job it's in a tub because I do not think this bad boy would be in a position to be squeezed out of a tube. It does not move in the pot at all, it looks solid and you have to kind of scoop a bit off the top with your finger to use it. It contains a blend of creamy nut butters, chamomile and evening primrose oil to provide instant relief to dry, sore and irritated hands. Overall I would recommend this to anyone with very dry hands, I usually buy my Dad and my Nana (who both get dry, sore hands) a tube of Body Shop Hemp hand cream but I think this would be a nice little change for them. At over £7 a tub it's not cheap but I believe if something works, paying a little extra won't hurt. Have you tried a Lush hand cream?